Born in West Yorkshire to a working class family I enjoyed a happy, secure childhood despite the problems of the country being at war with Germany. School days were a mixed bag of good and bad, and I was glad to leave aged 15 to begin work in a commercial art studio in Leeds. So here I was, on the threshold of working life with high hopes. The studio produced signs, posters, silk screen printing. As an apprentice, my job included cleaning, making the tea and running errands. The daily routine was hard and interesting, but deep within me was an emptiness, a boredom, that had not yet been filled. The question of death and the after-life also disturbed me. I was happy on the surface, and considered myself good and decent, especially compared to my workmates. I had always believed in a god out there somewhere, but I had never, ever, set foot inside a Sunday school or church. My family had no religious interests. To escape boredom, I spent time in the many cinemas which thrived before the introduction of affordable television sets. Hollywood was in it’s heyday, and a spectacularly new dimension of cinematic invention arrived at our large Odeon cinema in Leeds. “Cinemascope” with stereophonic sound, featured a new wide-view screen, three times the width of old screens, plus a superb wrap-around sounds system. Keen anticipation drew me one wet winter’s day to sample the delights of this new cinematic experience. The film chosen to launch this epic technology was an epic in its own right. 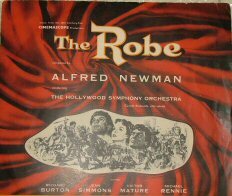 The title of the film, “The Robe”, the stars of the film, Richard Burton, Jean Simmons, Victor Mature, Michael Rennie. The story, set in the days of the Roman Empire, tells of the crucifixion of Jesus Christ and the impact this event had upon the various characters. I had seen hundreds of films, but never one that impressed me as much as this one had, especially on the artistic level, the colour, the music, the gripping story, but the most important aspect was to see how the followers of Jesus really lived, with love, peace and purpose. I longed to have this quality of life, but I knew little about Him. Back at home I found an old Bible and for the first time ever, began to read the stories of Jesus. I felt certain that these words written so long ago, were speaking directly to me. The promise of life everlasting was for me, and I need never again fear death and of being condemned for my sins, for on the cross Jesus died to forgive my sins yet came to life again, so that I could live forever in His glorious eternal kingdom. Day after day as I continued to read the Gospel stories I became more and more convinced that Jesus Christ was God’s Son and had all the answers for life and death. I desperately wanted my life changed and my eternal destiny secured, so I prayed, “Lord, if all these promises are true, please make them real to me” and He did! Jesus became real to me and has guided and blest my life for over 53 years. Dear friend, this life in Jesus can be yours if you ask Him for it, as you repent and believer.